A few weeks ago, I noticed outside my office window, a lone Coyote. It was a daytime sighting made in the late morning—around 11:00 am. 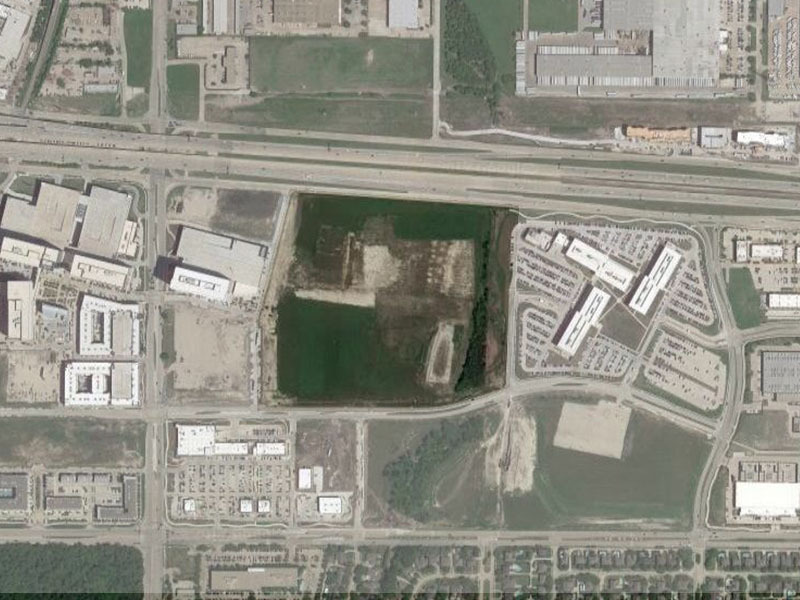 I first noticed the Coyote making his way across a large open field adjacent to our office complex. For some time now I have been making a point of keeping an eye on the this field. It is a perfect habitat for an urban Coyote, and I knew it would only be a matter of time before I spotted one out there. In that sense, it was very gratifying to finally see one. This plot of land was an old farmers field and used in that fashion until just recently. A mature residential subdivision lay immediately to the south. Our office complex sits on the eastern border and another set of buildings can be found about a quarter mile to the west. The north is bounded by a large six-lane freeway complete with six additional lanes of service road on either side. The field—Expressway to the north. Offices on the east and west. And a residential subdivision to the south. A wooded stream bed bisects the field in an almost perfect north-south alignment. The creek begins just north of the highway, emerging from under an expansive industrial park. 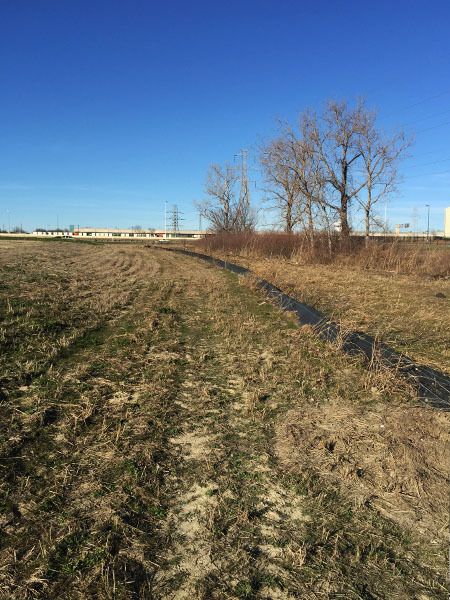 It picks up again on the south side of the expressway, cuts across the field and then flows for about a mile through the residential subdivision. The Coyote was following the tree-lined stream bed working his way toward the highway. Along the way he paused for a moment and seemed anxious and uncertain. He would lay down tentatively, only to get up again to pace in a tight little circle. He repeated this behavior several times, continuing to trend toward the north, but making very little real progress. To me, the Coyote clearly had a destination in mind—a place that he wanted to be—but it appeared that something was causing him to hesitate. This is the spot where the Coyote was waiting. 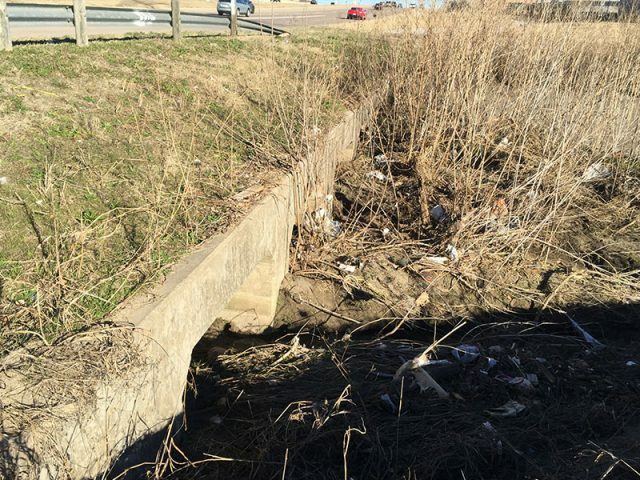 A road crew collecting trash near the highway may have been motivating him to linger here. 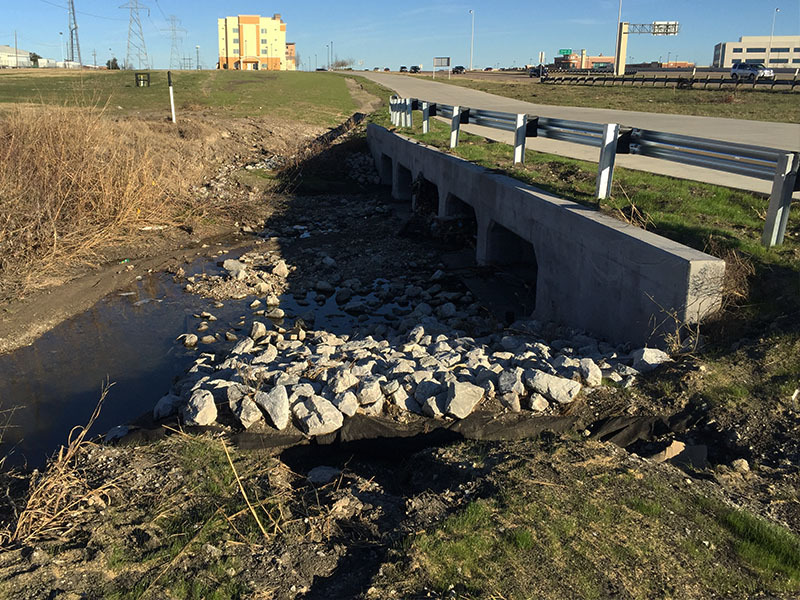 Ahead of the Coyote—not more than 100 yards—the creek and tree line came to an abrupt end where they intersected with the expressway. I was puzzled by this. The Coyote seemed so intent on continuing on, but once he got to the highway there would be nowhere else to go. What could he be up to? 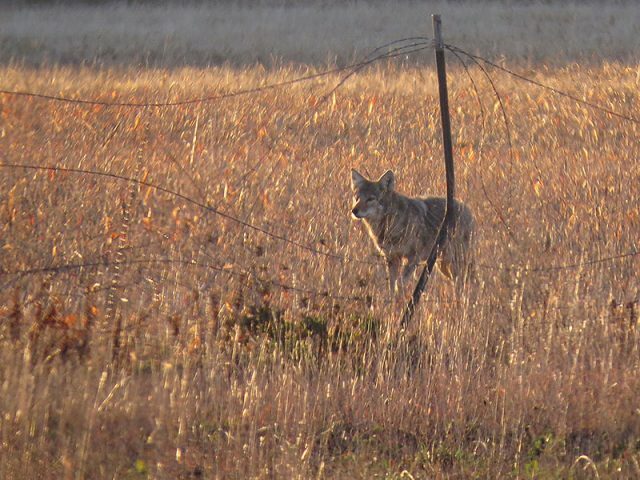 Finally, something about the situation changed and the Coyote again felt confident to proceed. He trotted toward the highway with determination and purpose. I lost sight of him behind the some tall vegetation just before he got there. I never did see him again. It was at that time a crazy idea crossed my mind. 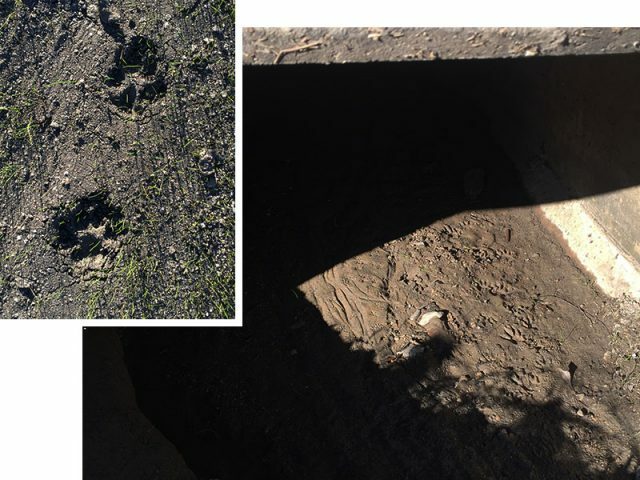 Surely, there was a culvert there where the creek met the service road—a system of concrete channels that would allow the creek to flow under the freeway. 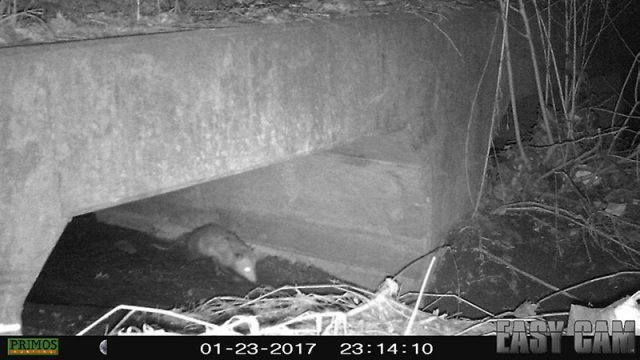 Could it be that the culvert was the Coyotes objective all along? 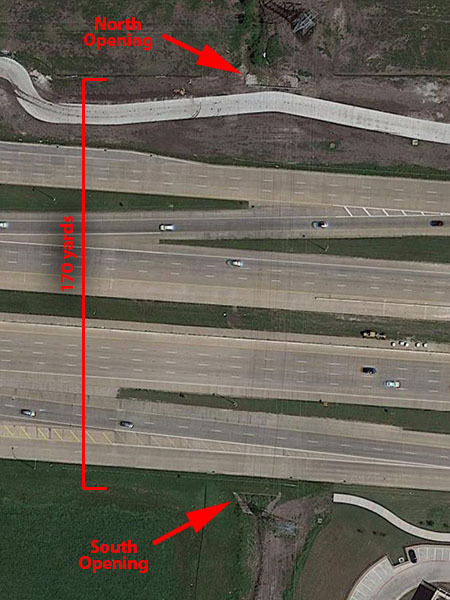 Was the Coyote planning to use the culvert as a passage from one side of the highway to the other? 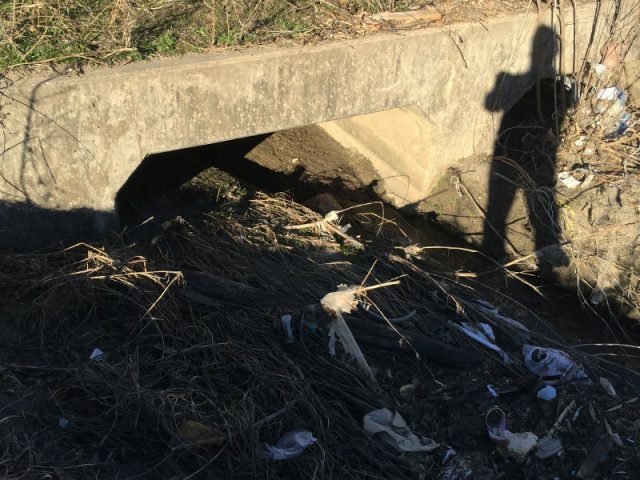 At this spot, the culvert would run for nearly 200 yards under the very busy expressway, and emerge in a seemingly uninviting warehouse district on the north side. I had my doubts, but I decided to investigate. A few days later, I visited the field with a few of my trusty trail cameras in hand. 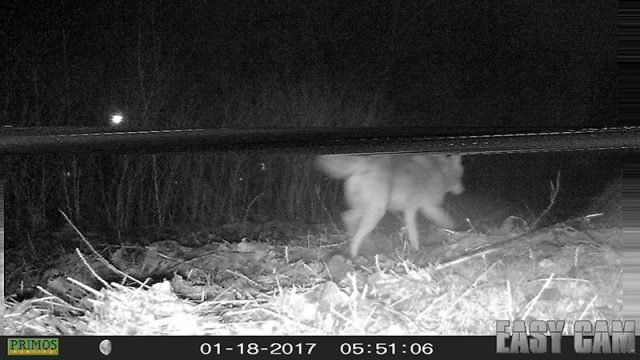 It did not take long to identify the tracks of Coyotes—and other wildlife—littering the ground near the woods and creek. At the culvert, I was pleased to find a single Coyote track leading in. 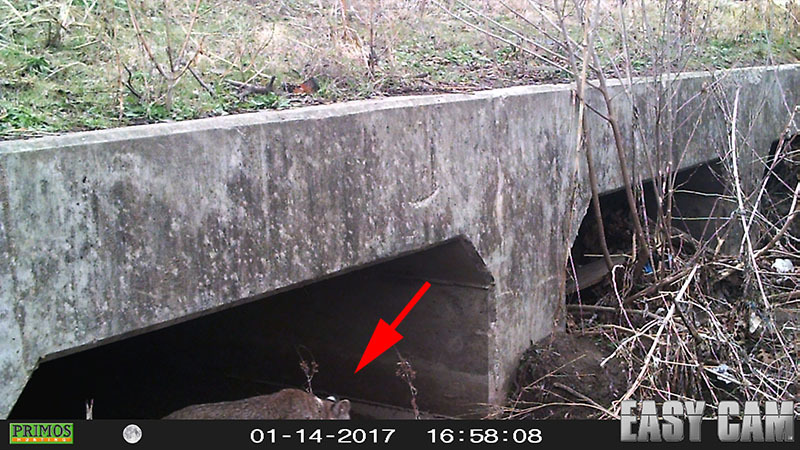 This did not prove the Coyote was using the culvert as a way to get from one side of the highway to the other—he could have just entered looking for shelter or respite. Still, I was encouraged and I decided to leave a few trail cameras behind. The culvert opening on the south side of the highway. Coyote tracks from the field, and a multitude of tracks leading in and out of the culvert opening. I only surveyed the easier-to-get-to south side of the freeway this time out. I just wanted to get enough pictures to make some quick judgments about what was what, and what was possible here. As I made my way around the field, I set trail cameras here and there in places I thought might give me some insight into the wildlife activity occurring in this area. A week of rainy weather followed and literally dampened my plans a bit—I actually lost one camera to damage caused by moisture. The severe weather even re-positioned some of my other cameras causing their pictures to be misaligned. But overall, the survey was a success. I documented a multitude of Raccoons in the area. Bobcats and Opossums were also recorded. 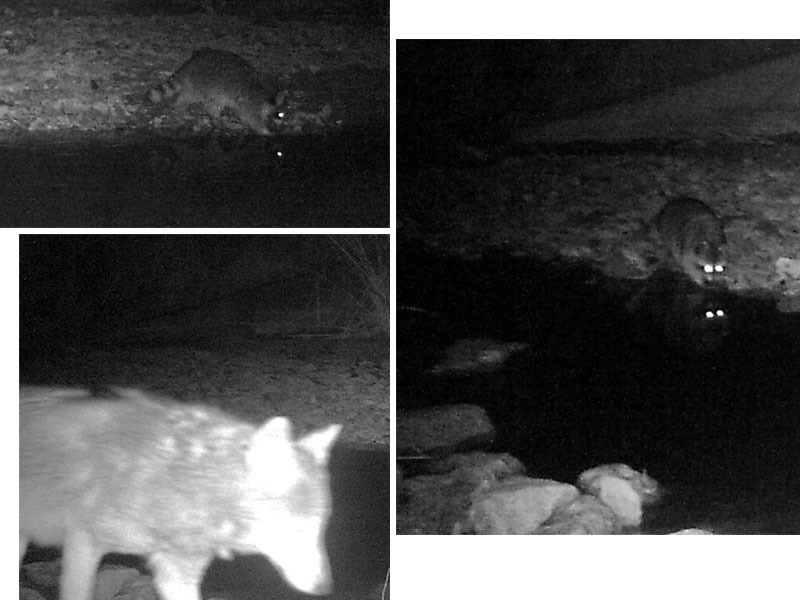 Oh yeah, and there was a lot of Coyote activity all up and down the wooded creek bed. Raccoons and Coyotes creek side. A picture of a roaming Coyote taken along the tree line just before the rain water killed my camera. I even got a few pictures of animals entering and exiting the culvert. This, of course, did not prove that they were traveling all the way under the freeway from one side to the other, but it did offer tantalizing promise! 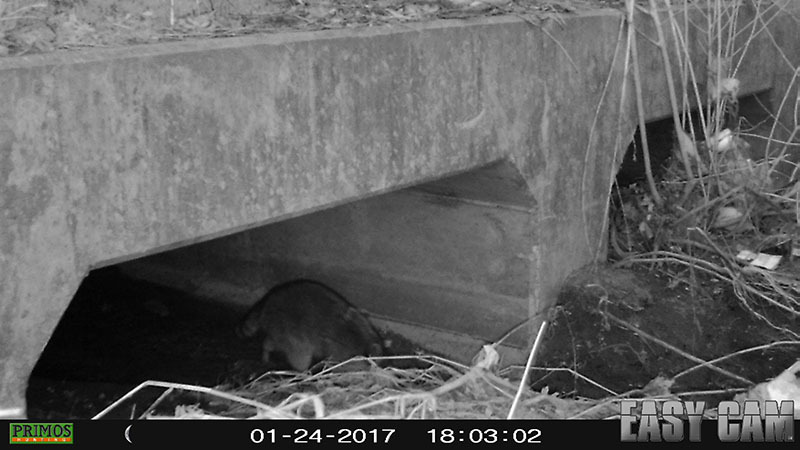 I returned about a week later, and with a forecast of good weather for many days ahead, I left trails cameras to monitor both the north and south ends of the culvert. 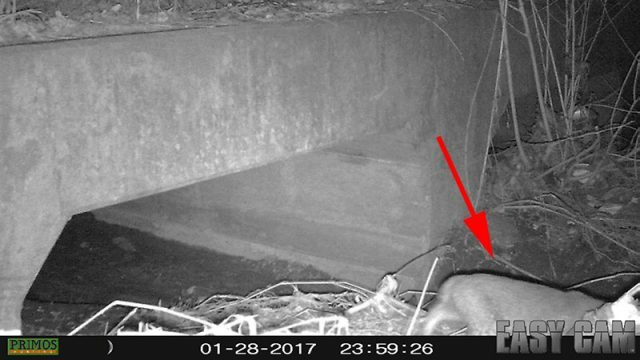 I hoped this setup would—with cameras monitoring both sides of the freeway—finally allow me to determine if Coyotes and other wild animals were using this culvert as an underground transit. The culvert opening on the NORTH side of the highway. Seven days later I collected my cameras and rushed home to take a look at what they recorded. I checked the first camera’s images with baited breath. This was the trail cam I had set on the south side of the freeway. Again I found the expected multitude of urban Raccoons pictures. 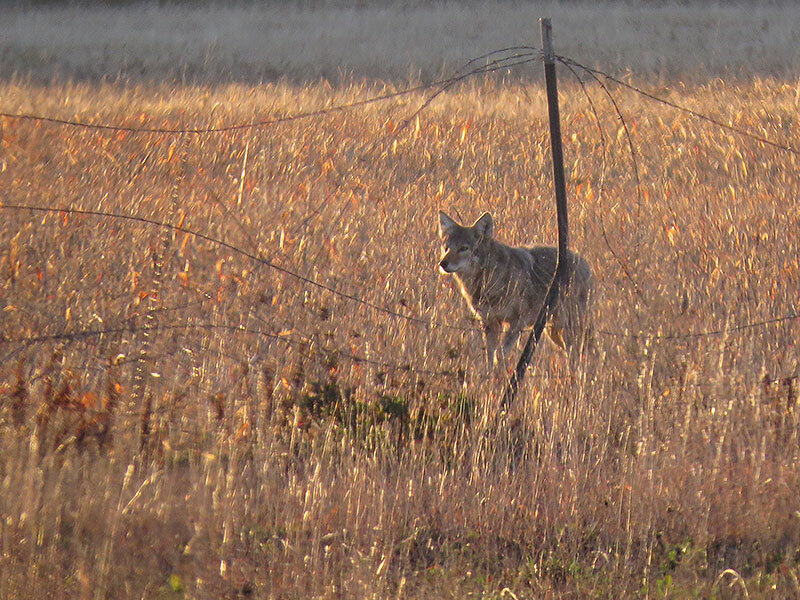 Then, toward the end of the list of images—a picture of a Coyote! A Coyote entering the culvert from the south on Thursday night at 9:33 pm. I quickly switched out the SD cards on my computer, looking now through the pictures taken on the north side of the expressway. What I wanted to see was a Coyote coming out of the culvert here on the opposite side of the freeway. And, sure enough, there he was! 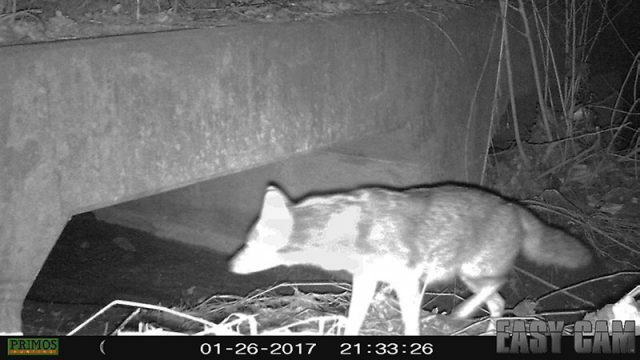 My camera had captured a picture of the Coyote coming out on the north end of the culvert roughly four minutes after he was recorded entering to the south. That’s a remarkable 170 yards traveled through a man-made tunnel beneath one of the busiest highways in all of North Texas! Really fantastic! The same Coyote exiting the culvert north of the highway just four minutes later at 9:37 pm. 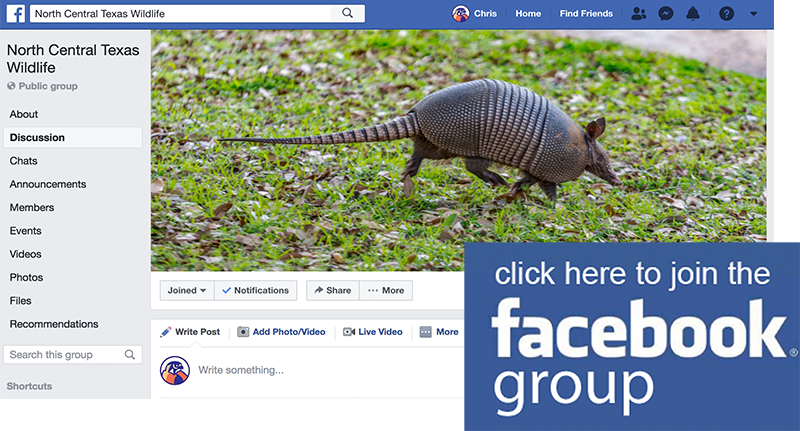 Other pictures showed Bobcats, Opossums, and Raccoons doing the same thing. I am amazed by this. Surely, just entering the culvert is fraught with danger. There’s no telling what might be coming toward you from the other direction. An Opossum might hope not to run into a Bobcat along the way. A flash flood could send a gully washer through the pipes—there would be very little recourse if an animal was caught in the middle with the water rising. A Bobcat enters the north end of the culvert on Saturday night at 11:55 pm. 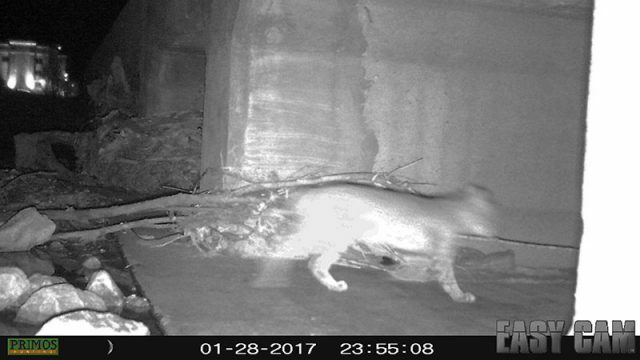 The same Bobcat exits from the south end four minutes later at 11:59 pm. The culvert runs for a full 170 yards under this busy highway. 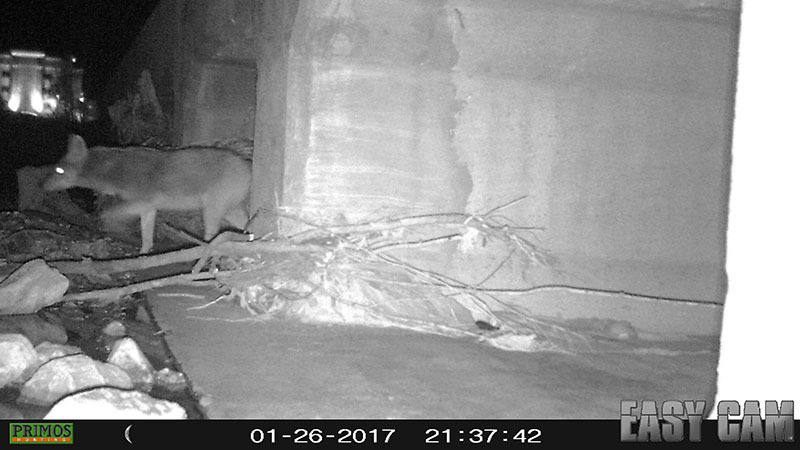 Certainly, passing under the highway like this is a learned behavior for many of these animals. As youngsters, many likely passed through while out patrolling with mom. But, one brave animal had to go first. Some special creature with an adventurous nature had to look at the culvert opening and wonder what was inside… and wonder where it might lead. History is full of people like that. Often they are our heroes. 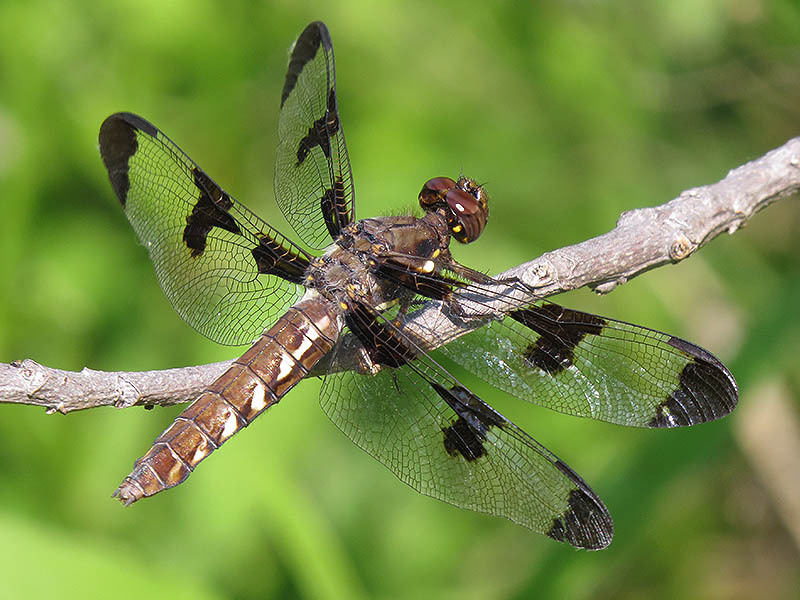 It is interesting to know there are thrill seekers and explorers in nature as well. The view looking across the highway from the north to the south. Fantastic article! You know, I’ve never thought to go explore places like this thinking, “too many buildings around.” Guess I need to start, huh? Wow–such an interesting article and so well written. Thank you for sharing your “research” with us! Quite fascinating. Last fall I was traveling on 635 West had just entered at Freeport Pkwy. I noticed a coyote walking down the median in the grass. His coloring matched the grass pretty well. I couldnt understand how it could be there without being hit. I realized later that Royal ln has a culvert too. I have heard of others seeing several in that area as well. Great story!! Thanks, Melissa! Isn’t this special? Nice, Chris. I have a suggestion concerning extending this study. Email me privately, davmcneely40@gmail.com .